Vitex is a beautiful shrub native to Greece and Italy whose berries have been used in herbal medicine for centuries. It is considered one of the most popular herbs in Europe and other Western nations for the support of gynecological imbalances. Modern clinical research and traditional use of Vitex have shown its amazing ability to help balance fertility hormones. Since Vitex does not contain hormones, it has a supportive, gentle and non-direct action on the body. Vitex is one of the most useful fertility herbs available to us. Inhibit follicle-stimulating hormone (FSH): Vitex increases the secretion of luteinizing hormone (LH), which in turn increases progesterone.Lengthens a short luteal phase: Studies have shown Vitex to be effective at lengthening the luteal phase. While it does not contain any hormones itself, it does help the body to increase its own production of luteinizing hormone (promoting ovulation to occur), which in turns boosts progesterone levels during the luteal phase of the cycle. May help prevent miscarriage: Vitex has a beneficial impact on progesterone levels. If miscarriages are due to low progesterone, Vitex may help to normalize or increase progesterone levels. Vitex may be considered safe to use during pregnancy, but make sure to consult with a health-care practitioner when using this herb during pregnancy. Also, make sure to read our ‘Use During Pregnancy’ section below. Relieves PMS: Clinical research has shown that Vitex may be very beneficial for PMS symptoms, especially depression, headaches, rashes, acne, allergies and sensitivity of the breasts. In one study improvement of PMS by the first month was experienced by 32% of the women. By the third month, 84% of the women experienced improvement of their PMS. Stabilization of menstruation after stopping birth control pills: After discontinuing estrogen-containing birth control pills, Vitex taken for several months has been shown to help stabilize the cycle and induce ovulation more quickly. Acne: Several studies have shown an improvement in the skin with the use of Vitex. Along with appropriate diet changes, Vitex may help acne. For optimal results, Vitex should be taken long-term. Clinical research shows that Vitex may start working within 10 days, but full benefits may not be experienced until 6 months or longer. For PMS, results are normally seen by the second menstrual cycle, but for lasting changes, it may need to be taken for up to a year or more depending on how long the imbalance has been present. Vitex is making fundamental changes in the delicate chemistry of the body, this is why it takes some time to have an effect. Since Vitex is a harmonizing and nourishing herb, it works behind the scenes to restore balance in a gentle way. Unlike a refined synthetic drug which forces the body to change, Vitex works to nourish and support the system bringing about long-term balance. 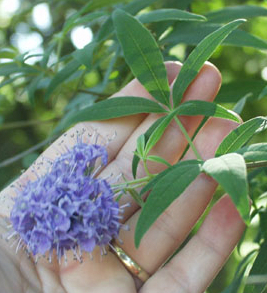 Vitex comes in many forms, loose herbs, capsules, tea, tincture, and powder. We find that capsules and tincture offer the most consistent results since it is easier to control the dosage. Many of the compounds needed from Vitex are easily extracted in alcohol (tincture) versus water (tea). Vitex is very strong tasting, almost bitter, so I would not suggest making a tea unless you blend other herbs with it, that is one reason capsules are so convenient. Perimenopause is the time leading up to menopause. Perimenopause typically begins at the age of 40. As perimenopause progresses toward menopause, it is normal for menstrual cycles to become irregular and for hormone levels to fluctuate. As ovarian reserve diminishes and egg health declines, FSH levels may rise. For some women, Vitex may be helpful in maintaining regular cycles and lowering higher FSH levels, but Vitex cannot reverse the aging process. It may or may not be effective for women in perimenopause, each woman is different. Vitex cannot bring back the menstrual cycle in women who have gone through menopause. German research shows Vitex can be taken safely through the end of the third month of pregnancy and may help prevent miscarriage. Vitex is still considered safe to take after the third month, but it is thought that it may stimulate lactation too early, so for this reason, it is suggested to not continue after the third month of pregnancy. Also, during the third month of pregnancy the placenta takes over progesterone production, so Vitex most likely won’t be needed. If you are deciding to use Vitex during pregnancy, we suggest you consult with a herbalist or midwife for guidance and supervision.